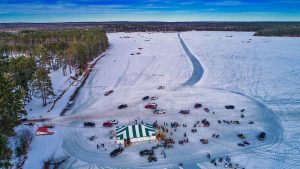 One of the area’s biggest ice fishing contest with prizes awarded in 8 categories, sponsored by the Manitowish Waters Sno-Skeeters Snowmobile Club. Ice fishing contest runs from 10:30am until 5:30pm, with more chances to win raffle prizes if you pre-register at Townline Sports or Lakeland True Value. Tent opens at 9:30am for registration. Opening ceremony begins at 10am. Ice fishing awards at 6pm. This family event has activities for all: kid’s games, free groomer rides, racing and photos with the “Famous Klements Racing Sausages” and live music. Food and refreshments are served in a 40’ x 40’ heated tent and raffle items including: ice auger, ice shack, generator, snowmobile and many more items. Stay for the event’s finale – spectacular fireworks over frozen Rest Lake.